The combined experience, commitment, perfectionism, patience and genuine caring attitude of our dental team are keys to our success. Dr. Chong graduated in 1985 as Doctor in Dentistry, from the Universidad Autonoma de Santo Domingo in the Dominican Republic. From 1986-1990 Dr. Chong was the company dentist for the Curacao Drydock Inc., providing comprehensive dental care to the Drydock’s personnel and their families. 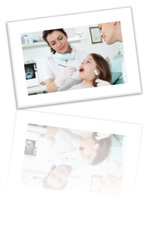 In 1990 Dental Clinic Chong and Associates was established. Dr. Wong-Loi-Sing graduated in 1989 as a Dentist, from the Universiteit van Groningen in the Netherlands. Since 1989 Dr. Wong-Loi-Sing has been practicing general dentistry in Curacao. In 1997 he joined the team at Dental Clinic Chong and Associates. Dr. Juliana Martis graduated in 2008 as Doctor in Dentistry, from the Universidad Cooperativa de Colombia( Medellín). She has completed her minor diploma in public health epidemiology. From 2010 she joined the team at Dental Clinic Chong and Associates. Healthy teeth and gums starts at home with good oral hygiene. Our hygienists are trained to instruct and inform our patients about oral hygiene and the prevention of dental diseases, as well as treat gum diseases. Ms. Reyerse graduated as a dental hygienist in 1989, from the Hogeschool Utrecht in the Netherlands. She gained broad experience working in a general dental practice in Switserland and a renowned periodontal practice in Utrecht, The Netherlands, as well as the University of Dentistry Amsterdam (ACTA) before joining our clinic in 1999. Ms. Reyerse is also trained and experienced in performing selected restorative / preventive /cosmetic treatments. Ms. Colak graduated as a dental hygienist with expanded duties in 2014, from the Hogeschool Utrecht in the Netherlands. Ms. Colak has been practicing at Dental Clinic Chong and Associates since 2015. Ms. Colak is also trained and experienced in performing selected restorative / preventive / cosmetic treatments. Our front office staff members are both knowledgeable and experienced in patient care and are the first point of contact with the office. The dentists at Dental Clinic Chong and Associates are delighted to offer you the best advice and service in all dental matters. Come and visit us for the best dental care in Curacao. Los odontólogos en la Clínica Dental Chong y Asociados se complacen en brindarles el mejor consejo y servicio en el área odontológica. Para el mejor cuidado dental en Curacao, venga y visítenos. De tandartsen bij Tandheelkundig Kliniek Chong en Associees zijn blij om u de beste advies en service aan te bieden op tandheelkundig gebied. Kom en bezoek ons voor de beste tandheelkundige zorg op Curacao. Pa e dentistanan na Klinika Dental Chong y Asociadonan ta un plaser di ofrese bo e miho konseho y servisio riba e tereno di salu di boka y djente. Bin bishita nos pa e miho kuido dental na Korsow.